HIGHBRIDGE, Bronx (WABC) -- A 22-year-old man was identified as a suspect in a stabbing at a Bronx subway station, across from Yankee Stadium, in a dispute over subway swipes. The incident happened around 2:15 p.m. at the bottom of the stairs leading to the station, near the turnstile. 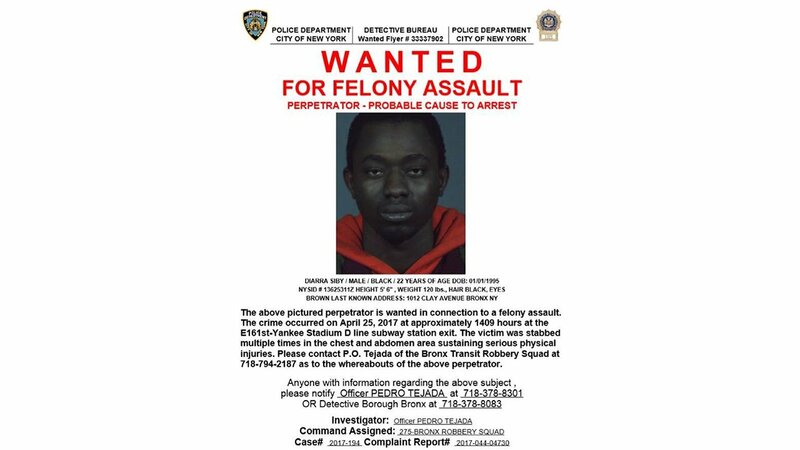 According to the New York City Police Department, Diarra Siby got into the dispute with a man in the walkway to the 161st St.-Yankee Stadium subway station just after 2 p.m. Tuesday. The victim was stabbed multiple times in the chest and abdomen. He was taken to Lincoln Hospital where he is serious but stable with a collapsed lung. The two were allegedly arguing about a subway swipes one of them was selling on the way to the turnstile. The station is near Yankee Stadium in the Highbridge section and serves the B, D and 4 lines.